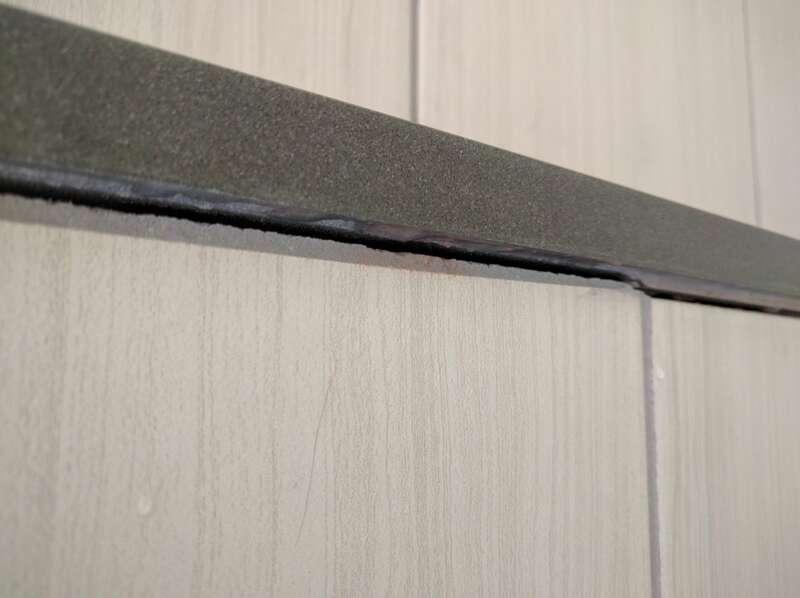 The grout under the shelves in the master shower is separating between the underside of the quartz shelves and the vertical wall tiles. The gap is one-eighth to one-quarter of an inch wide. Jacquela makes the discovery while cleaning the shower — which means this fault is new, because the shower was cleaned two weeks ago and this problem did not exist. Are the shelves lifting? 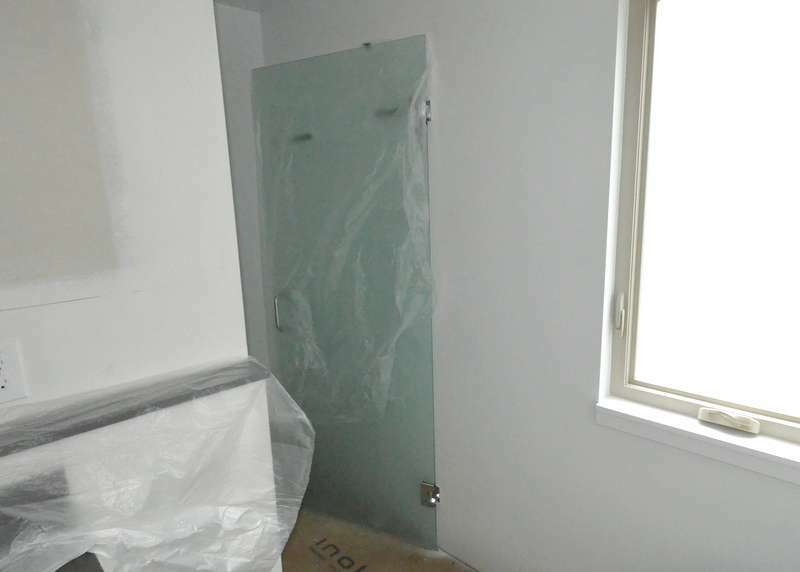 Are the walls and floor of the shower settling? Steven takes pix and reports the new problem to Ranserve. Jacquela objected to the mis-alignment of grout lines in the master shower. Jacquela and Steven debated what to do with Ron Dahlke and Mark Rehberg. Above, Julian mortars 12×12-inch sheets of 2×2 black mosaic tile, using the 12×18 black tile as the underlayment. 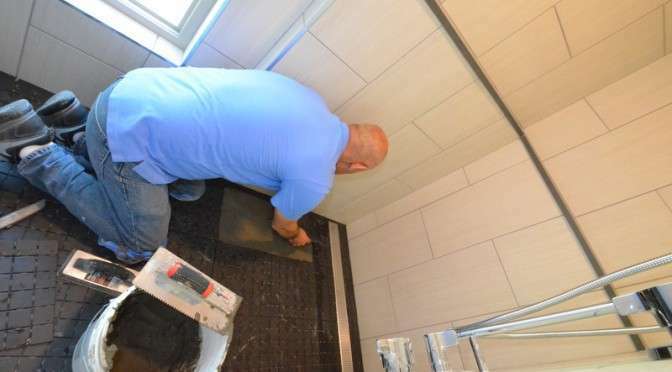 This requires acrylic mortar to help prevent the growth of mold between the two layers of tile. 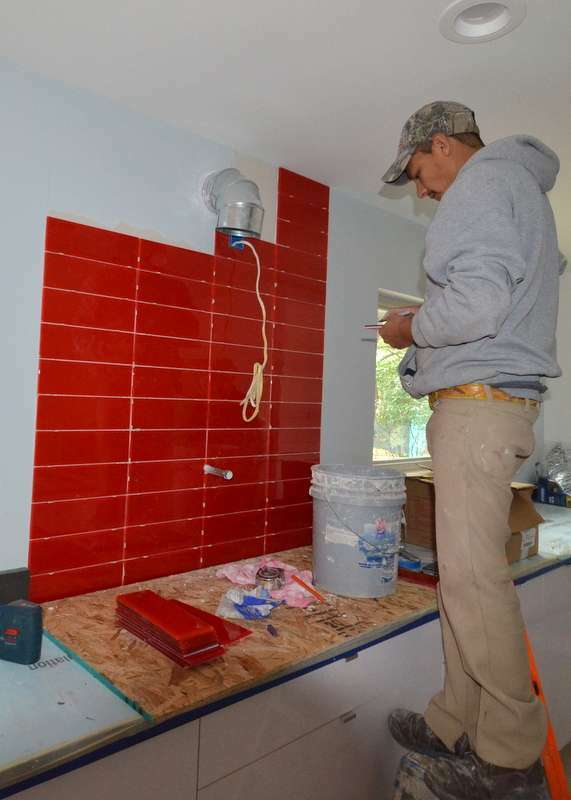 Julian returns tomorrow to grout the tile. Ron is back. Yay. Still recovering from the attack of the nearly-killer virus, eager to get back to work. 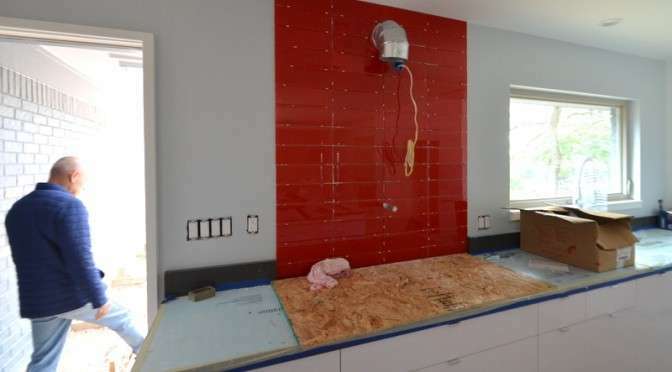 Above, photo of the red glass tile that is pulling away from the backsplash wall in the kitchen — discovered yesterday by Steven and reported to Ron by text message. 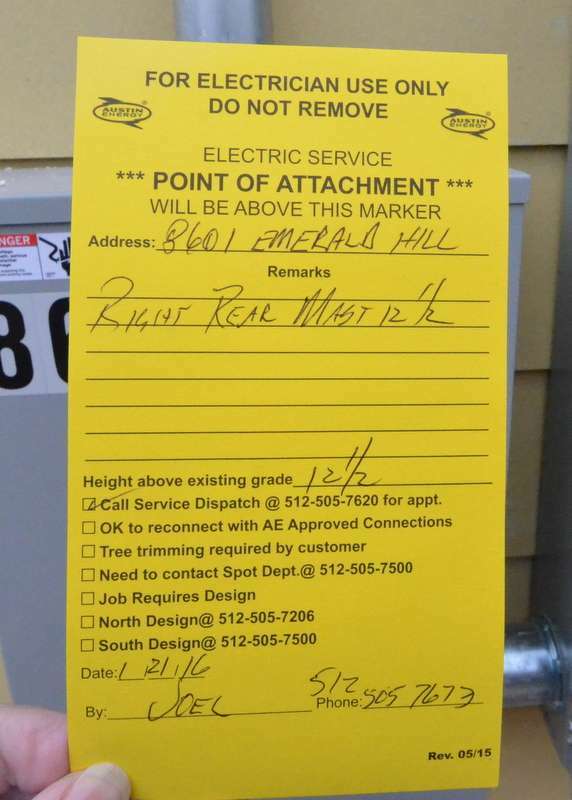 Emerald Hill did not pass the electrical inspection yesterday in part because baffles and lights are missing from bathroom ventilation. Kevin and Ron began to install these today. Here’s Kevin on the ladder in the water closet of bath 2. 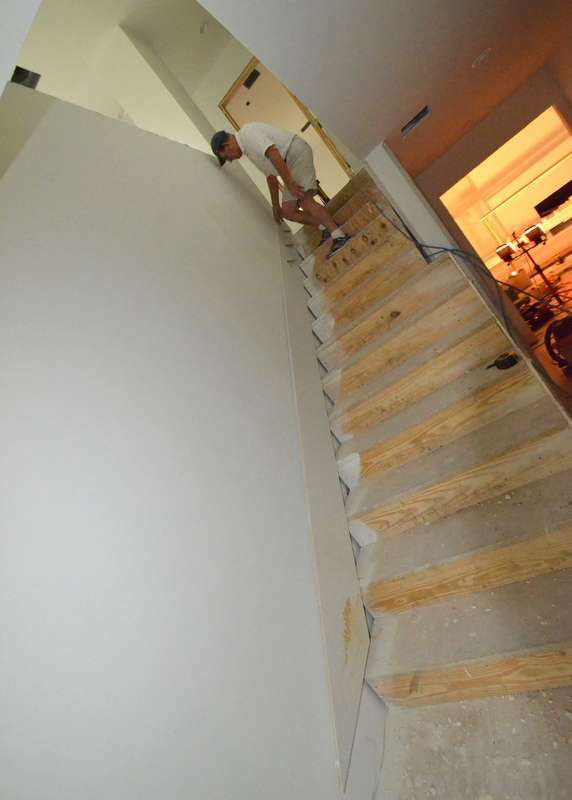 Above, Luis from Landers Flooring is back to remove and replace one stair tread. The balusters for this tread were drilled in the wrong place. Today, Luis removed the balusters and existing hickory tread, then fitted the replacement. At the end of the day, he clearcoated it with polyurethane. Mauricio and the team from Gilsa Construction today began to install the heavy steel edging for the deck off the kitchen door. 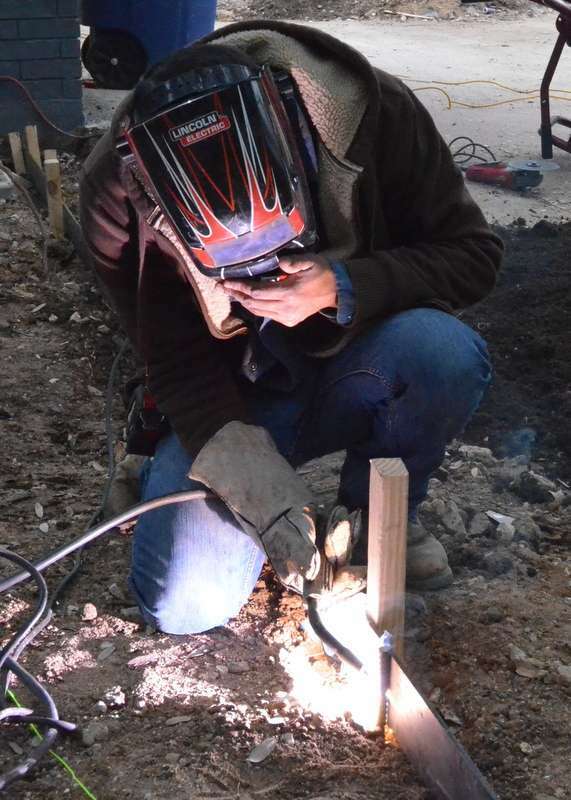 Mauricio welds the straight metal edging to a rebar post he sledgehammered into the ground. 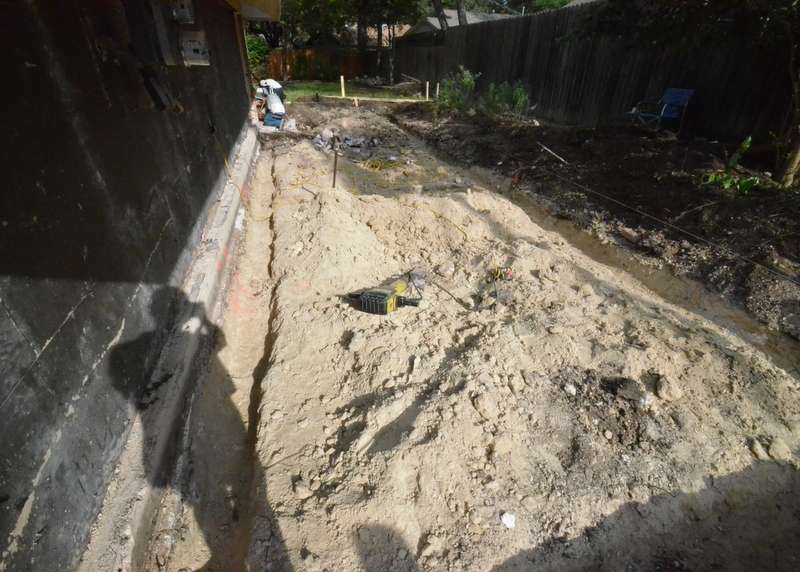 Joel from the City of Austin inspected the boxes and location for the new residential electric meter. Steven called Dispatch to ask the City to install the meter. and the second door to the shower in bath 2, Jadin’s bath — the panel at right, with the long chrome handle. 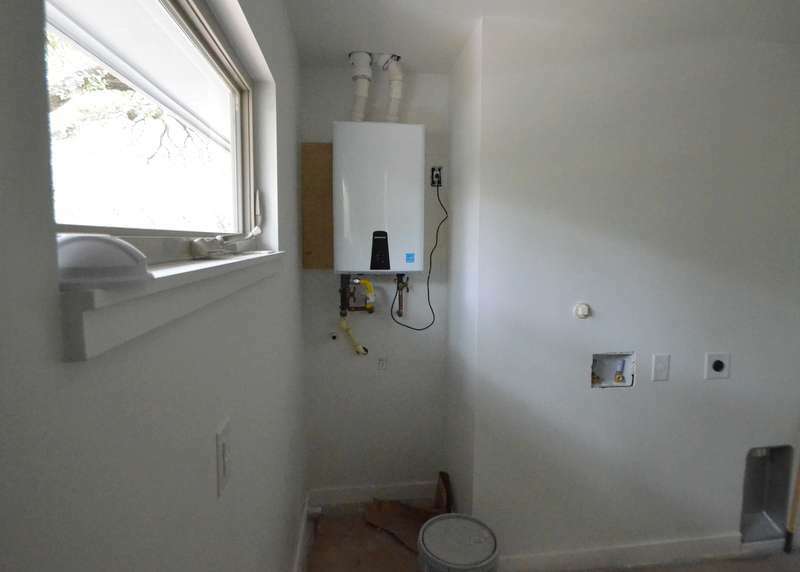 The tankless water heater is installed upstairs in the laundry/utility room. Ron Dahlke asked Steven to start a “punch list” of items that need attention. Here’s the first one — this is one of the showerhead fixtures in the master shower. It’s missing an escutcheon. 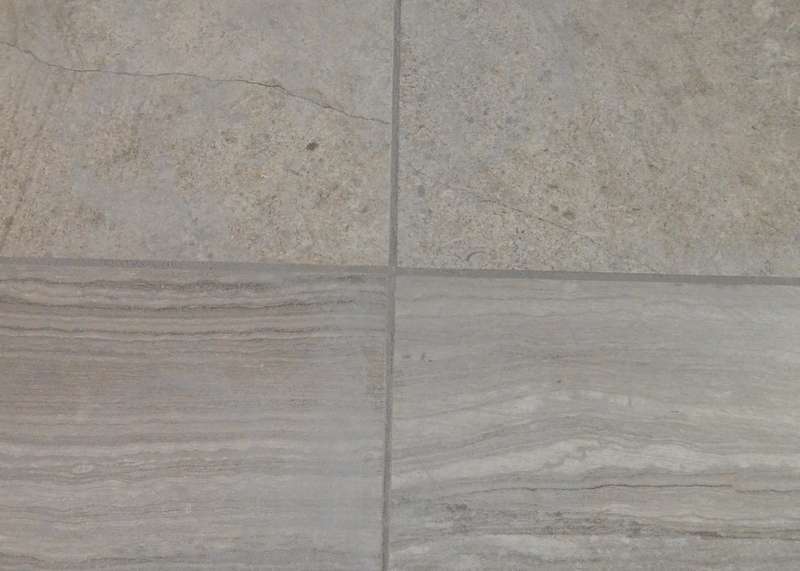 As a result, the cutout in the tile is exposed. 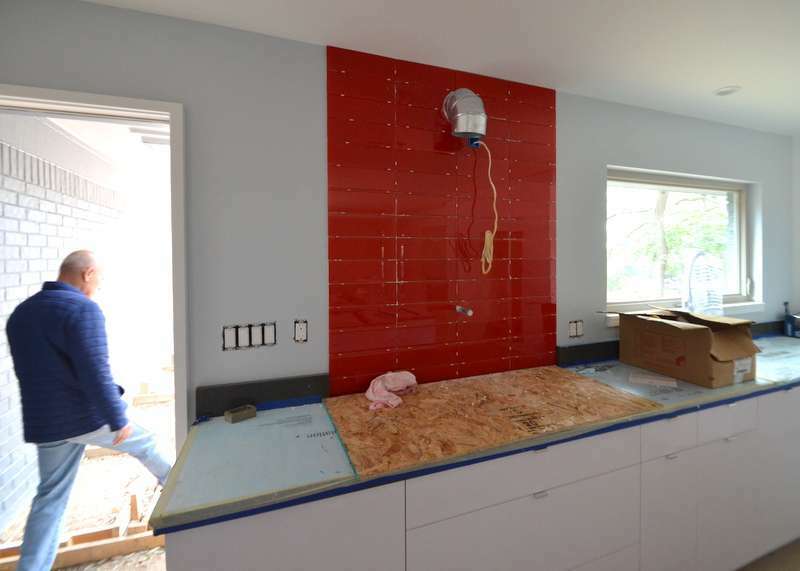 Is that backsplash red enough? 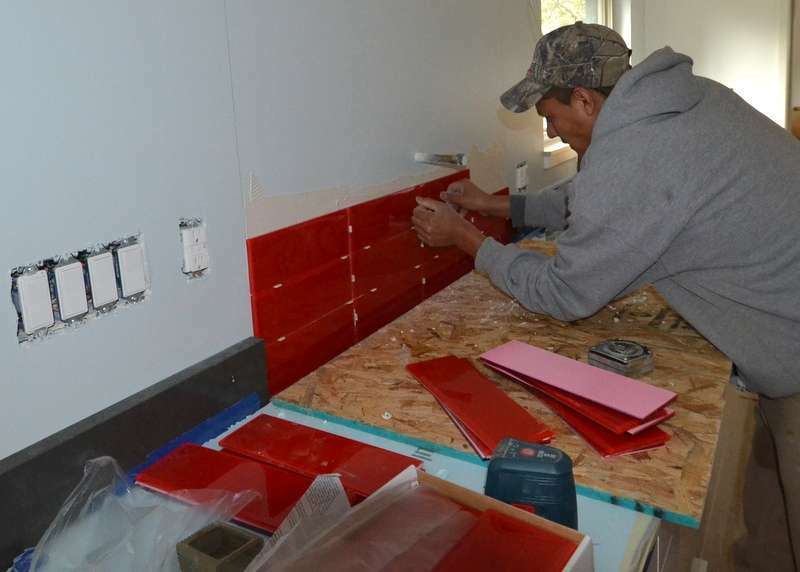 Jacquela wanted a red glass backsplash behind the cooktop. We researched and priced a sheet of red back-painted glass, four feet wide by five feet tall. 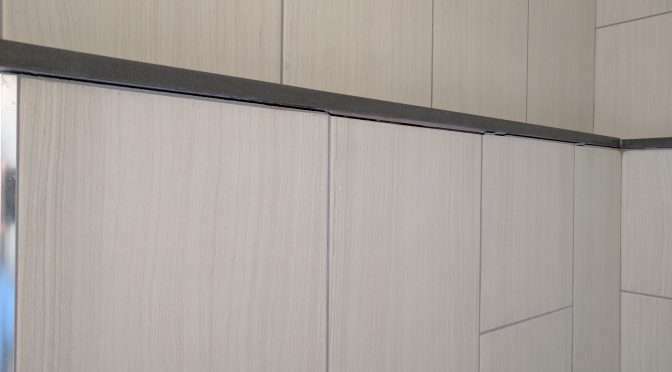 The estimates came in at more than $2,000 and the installer refused to warranty the glass against breakage, because we are mounting a pot-filler spigot above the cooktop, and the exhaust fan above that — and every hole in the sheet of glass compromises its integrity. 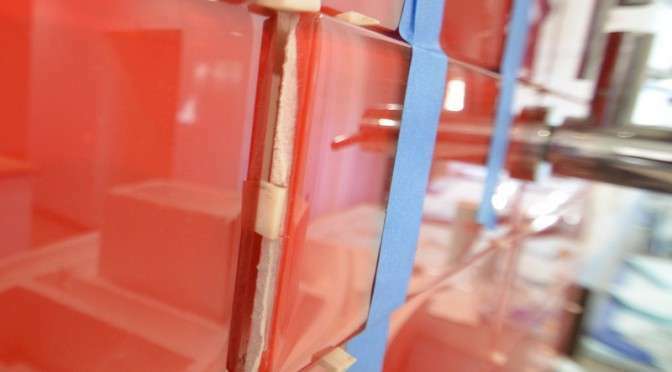 Plan B is red glass tiles, four inches tall by 12 inches wide. Julian and Ernesto today installed the tile. 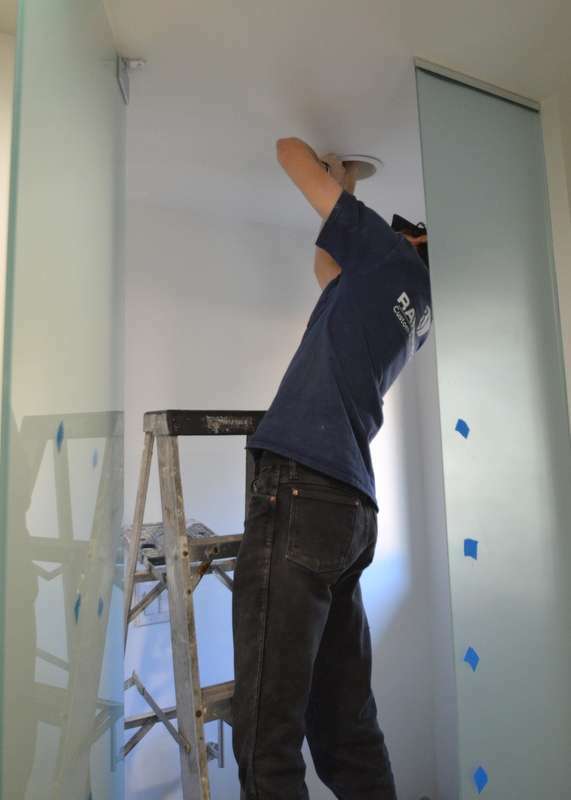 Ernesto starts by troweling on white mastic, using the grooved end of the trowel to set the depth of the mastic, flipping the trowel around to the straight edge to smooth the grooves out of the mastic, because the grooves would be visible through the glass tile. 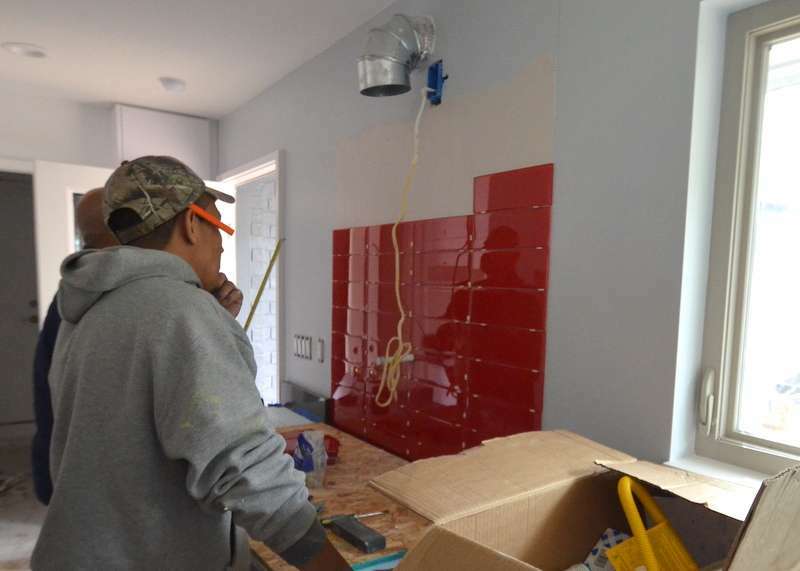 The first rows go up swiftly, with 1/16th inch spacers for the red grout that will be installed later. 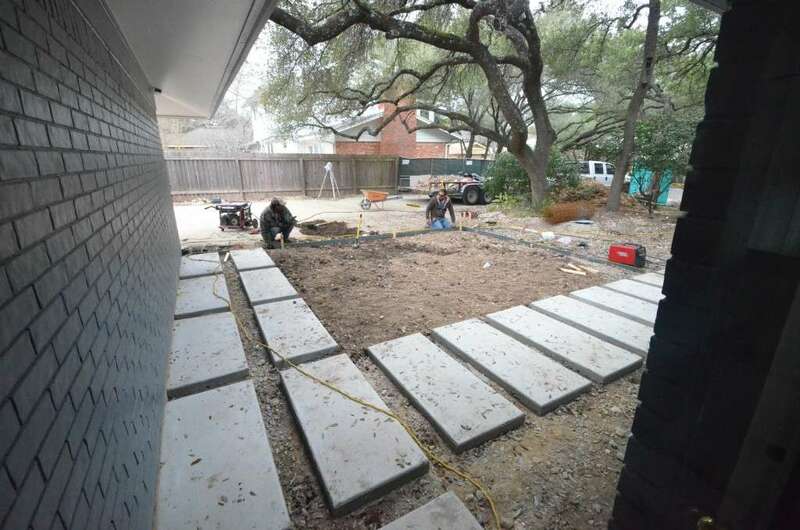 Ernesto, right, and Julian, at back, plan ahead for the next rows of tile. 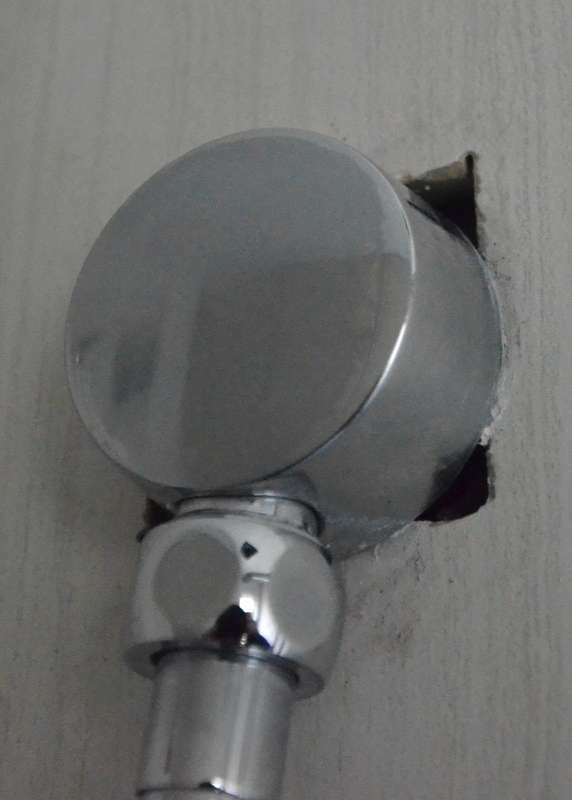 They have already made small cuts in two tiles for the pipe where the pot filler will be installed — partly obscured here by the yellow electrical cable. Atop a ladder — no one is permitted to stand on the countertop! 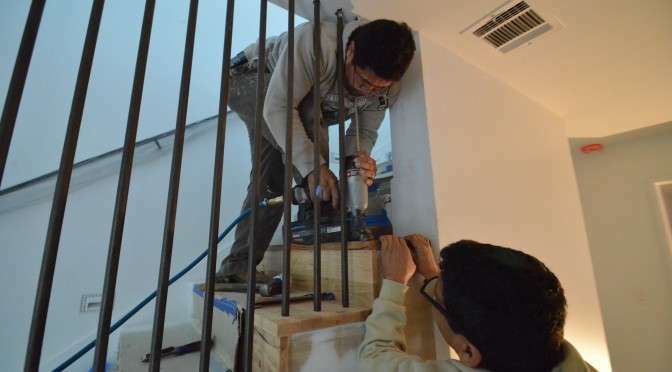 — Ernesto begins working around and toward the fittings for the exhaust fan and the electrical outlet that will power the exhaust fan. 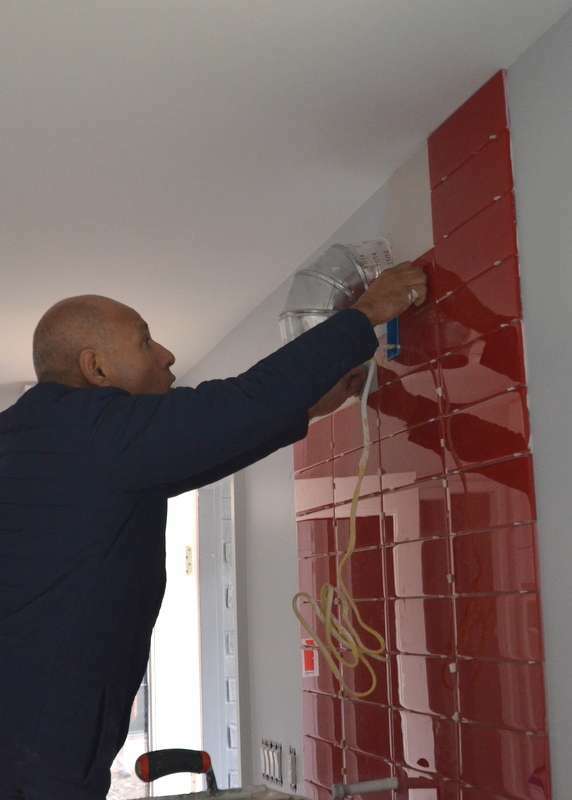 Julian works the glass tile around the exhaust fan and power outlet. And he walks away with the tiling done. Can’t wait to see this in bright daylight — instead of an overcast day — and with the kitchen lights switched on. Brandon Pettit from Thomas McCarthy Inspections inspected Emerald Hill today for SouthStar Bank, as part of authorizing payment of Draw #5. Rain cleared out. Above, the construction team is back to compact the road base for the foundation of the new garage bay. 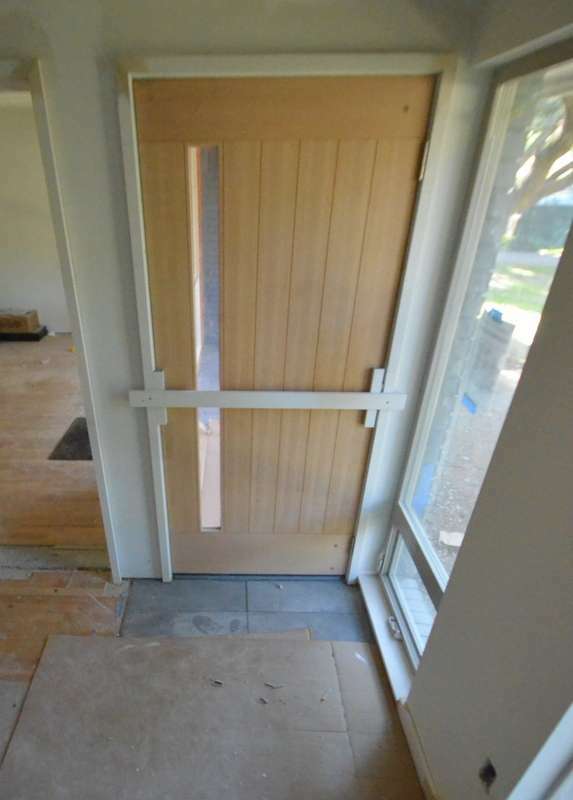 Julian and his team of tilers installed the last two tiles at the front door — the two tiles closest to the door. And the kitchen floor is now grouted. Shane and Peter, the carpenters, have vacated the loft they were using yesterday as the wood shop. 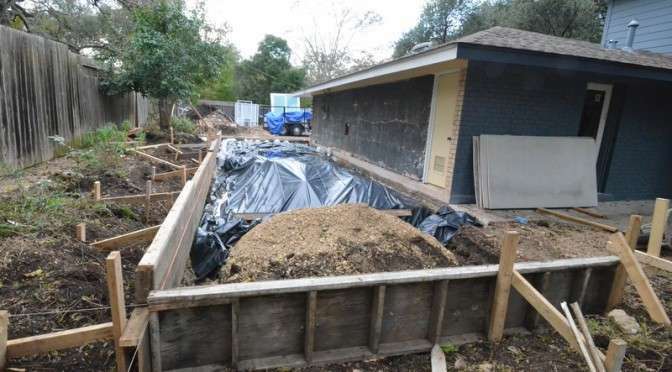 In fact, they are done with Phase 1, expected back in December. Outside work on the garage is called off because of heavy rain. The crew protected the open pit with plastic before closing up last night. A cold front blew through overnight, dropping the high temperatures into the 60s with an overnight projected in the 40s. Welcome to winter in Austin. 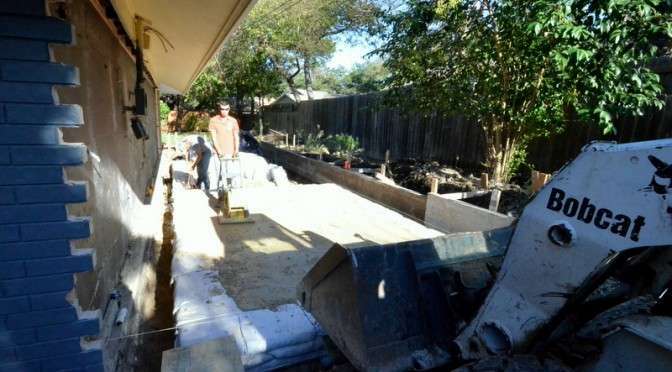 After 5 pm, Julian and his team of tilers arrived to grout the kitchen floor. 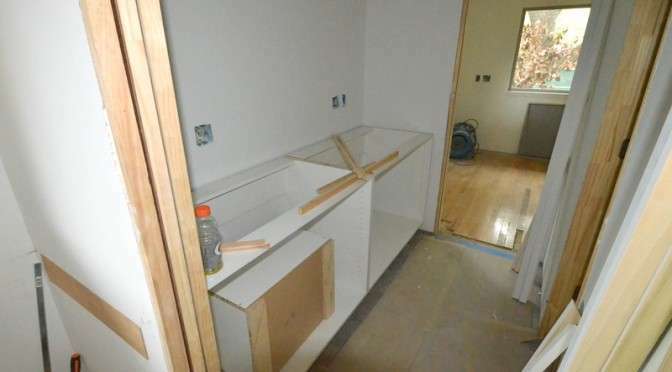 The plumbing fixtures are still on schedule for delivery Wednesday/tomorrow. 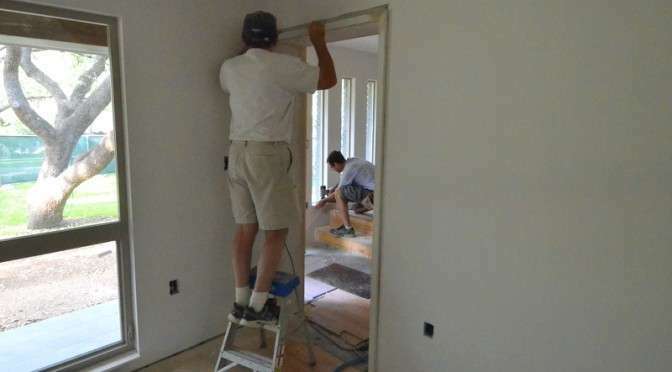 Above, Peter installs the casing around a passage that does not get a door — at the passage from the entry hall into the dining room/library. 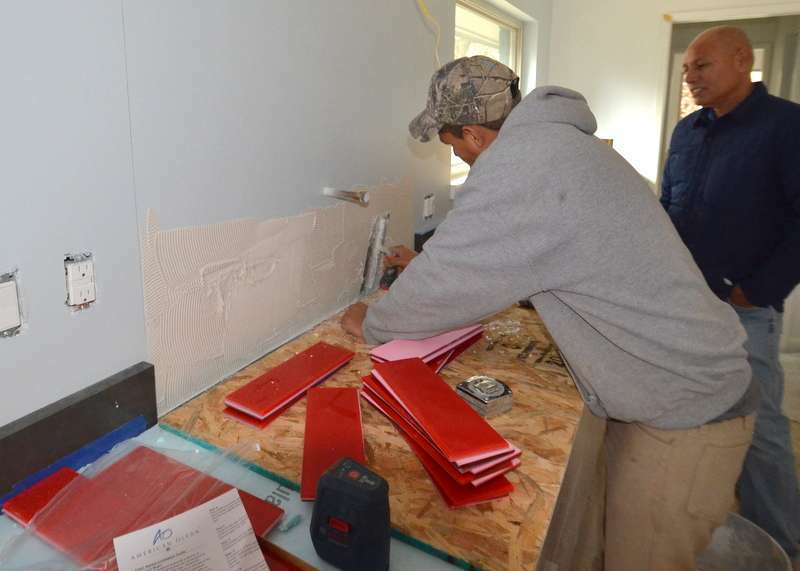 Beyond, in the entry, Shane installs window trim and baseboard. Ranserve submitted Draw #5 for payment. Brett Grinkmeyer, architect, visited Emerald Hill today with his copy of Draw #5, to review progress and completion to date. His first visit in several weeks. “I’ve been following the web site to keep up,” he reports. 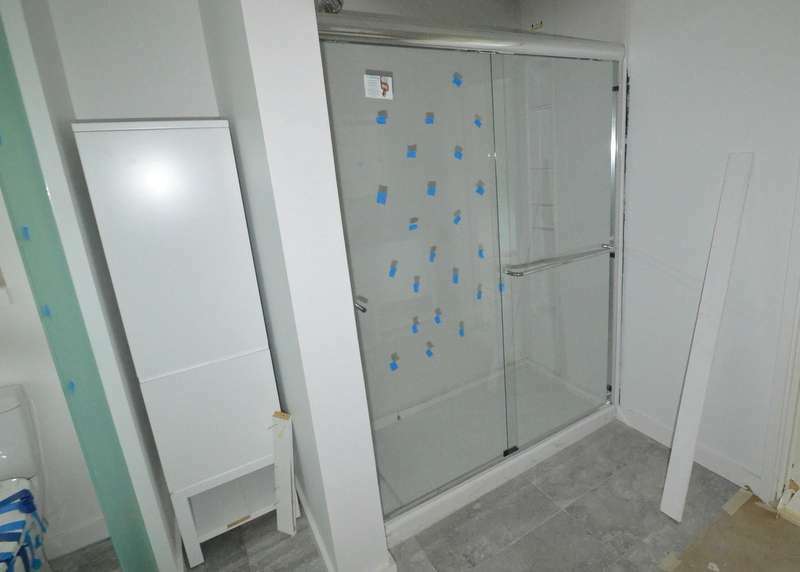 Ron Dahlke and Steven took advantage of Brett’s visit to ask for ideas on how to solve the grout lines that do not align in the master shower. Brett suggests a smaller tile — one, two or three inches, maybe four or five, laid as a mosaic, in a concrete black that matches the black tile floor that will be chipped out, or a complement to the gray wall tile that we hope to retain because taking it out is a much-larger removal project. Steven put a call in to Renee at ProSource to begin researching tile options. Surveying and setting out string lines for the foundation beams at the back of the new third bay of the garage. Brett and Steven also pulled out a tape measure to doublecheck the dimensions of the garage extension as the beams are dug for the foundation. It is spot on. Brett asks to photograph Emerald Hill for his portfolio. “Of course,” Steven replies. 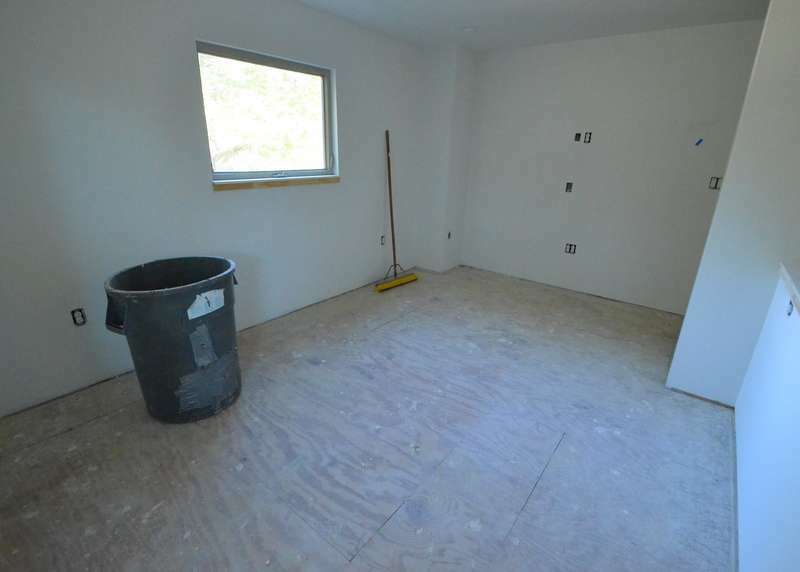 Ron reports that the hickory flooring may be delivered as early as next week. The electricians have been back, installing outlets upstairs. 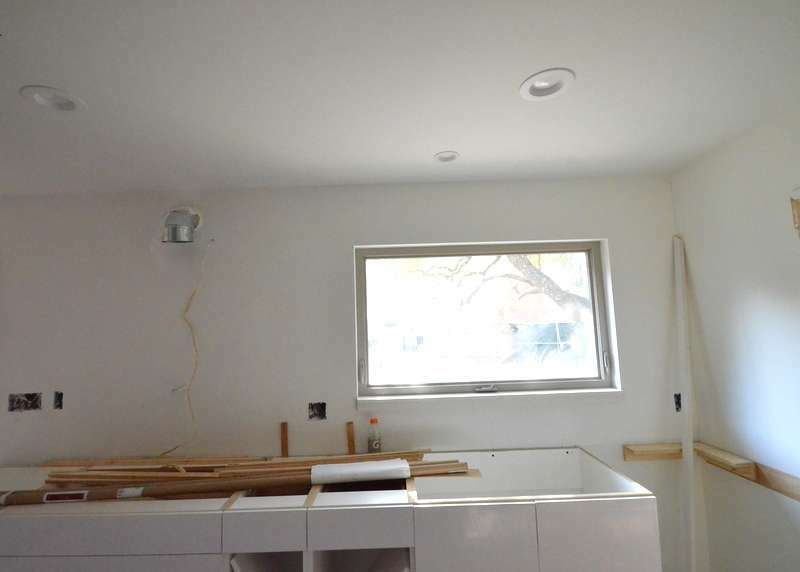 And the final LED light directly above the kitchen sink — the smaller 4-inch fixture closest to the window, not the 6-inch fixture closer to the camera lens. The angle of the photograph makes it appear as if the LED is not centered. It is.